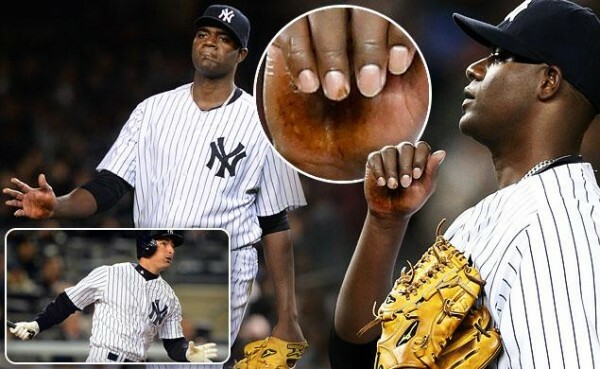 The funny thing about the mystery substance on the hand of Michael Pineda which did or didn’t help him lead the New York Yankees to a 4-1 win in their series opener against the Boston Red Sox? Only the media is actually making this an issue, while the players on the opposing team didn’t really seem to mind. Pineda had a strong performance, leaving the game after six innings, allowing only four hits and one run while striker out seven batters. Footage showed he had a tar-like substance on his hand. Pineda said it was simply dirty, and that he sweats too much between pitches which made the dirt turn into that dark mud. When Pineda came out to pitch in the fifth inning, John Farrell (Red Sox manager) said it appeared like Pineda’s hand was wiped clean, so he never brought it to the umpires attention. Brian O’Nora, the umpiring crew chief, said no one brought it to their attention during the game, so there really wasn’t anything for them to do about it. Pineda himself that it wasn’t pine tar or anything else, telling everyone it was dirt mixed with sweat. But with Red Sox players making it a non-issue, than it really might be something negligible. The opposing starting pitcher, Clay Buchholz, has been accused in the past, specifically last season in a game against Toronto, for using rosin sprinkled on sunscreen on his arm. Buchholz said the issue here is not getting hurt, and if something makes a player get a better grip on the ball without it giving him an edge when it comes to control and the ability to make it move differently and trick batters, he doesn’t see the problem with it. Others on the Red Sox team didn’t try to make the loss and the struggles of hitting Pineda’s pitches about the pine tar, with David Ortiz saying that everyone in the league uses it, and he doesn’t see what the big deal is. The Yankees scored their four runs in the 4th and 5th innings, including Jacoby Ellsbury getting an RBI single and a run against his former team, while Dean Anna hit his first home run of the season. The Yankees are once again at .500 while the Red Sox fall to 4-6 since the beginning of the season. Jon Lester and CC Sabathia will be on the mound for the teams in the next game, while Pineda’s next time on the mound will probably be on April 16 against the Cubs, with many looking to his palms to see what he’s using this time, if anything at all.